By now you know that I am fairly obsessed with colored eye liners. 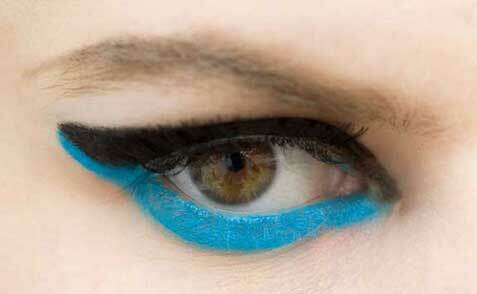 Especially turquoise colored eye liners. That’s why when I saw these pix from Chanel’s 2013/2014 Cruise Collection, it was love at very first sight with the eye look created by make up virtuoso Peter Phillips. Take a look… isn’t it gorgeous? Now, here’s the rub. According to info coming in from Chanel, the bold sliver of blue on the lower lash line is courtesy their new Stylo Yeux Waterproof Long Lasting Eyeliner in True Blue. Cue: extreme impatience to order True Blue as soon as it hit the shelves. Only to be reminded of a lesson oft learnt: one should not believe everything a brand says. True Blue is terrible. TERRIBLE. 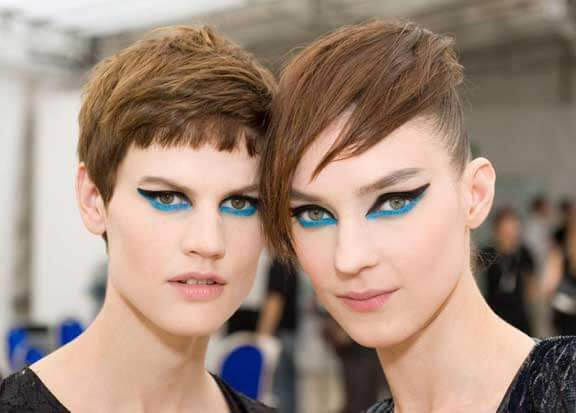 And it doesn’t come anywhere close to the make up looks we saw at the Chanel Cruise Collection. Instead of being beautifully, vibrantly opaque, it’s sheer and almost impossible to build up, no matter how many layers you rub on! And I say “rub on” because this pencil is very, very dry and stiff. It tugs the skin horribly and simply does not go on smoothly however hard you try. And in the end it just ends up looking like a sheer, uneven wash of a pale blue hue. No jewel toned effect, no chance of getting the sharp, super-graphic effect that we see in the pix above. See this swatch… and remember that when I swatch an eyeliner on the arm (like here), the amount of pressure is much more than I would use at the lash line. Now tell me, how does this match up to these eyes from the show. Have you tried the Chanel Stylo Yeux Waterproof Long Lasting Eyeliner in True Blue? Liked it? Hated it? Or bought some other beauty product based on a brand’s promise and came away dissatisfied? Do share… maybe we can get someone to actually listen! Omg thats terrible. I saw the 1st pic & i was like: i’m getting it. Build up the area like a canvas… Primer, white, fixing powder. Then pull a trick we did in the late 80’s: use a lighter to soften the tip. Product should go on and look heavenly. Careful not to burnt your sensitive eyelid! Let me know it it works for you?